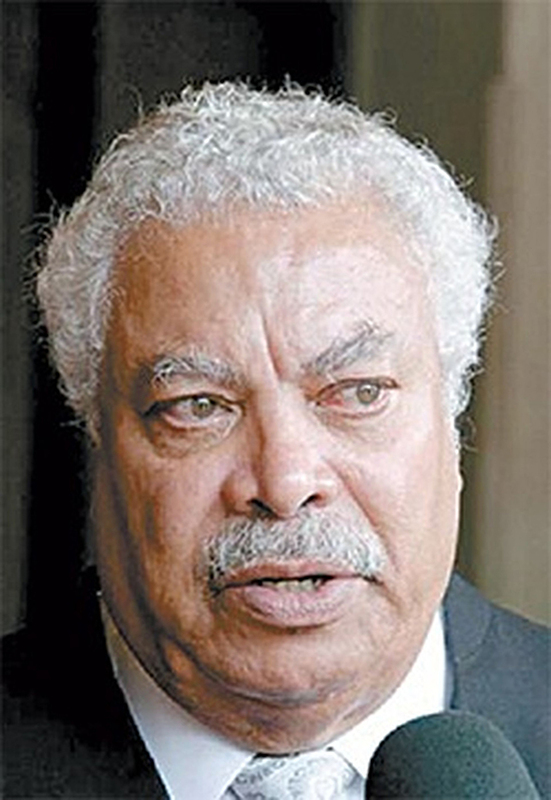 Queen’s Counsel, Senior Counsel and Guyana’s first attorney general, Sir Fenton Harcourt Wilworth Ramsahoye, died yesterday at the age of 89, at the Bayview Hospital in Barbados, after a brief period of illness. His son, Bernard, a professor in medicine, was with his father at the time of his death. Sir Fenton leaves to mourn his widow, Phyllis, two sons and other relatives. His wish, his brother, Dr Walter Ramsahoye told Stabroek News, was to have his remains cremated wherever he died and to have them returned to Guyana to be buried in the Blankenburg Anglican Churchyard, closer to his childhood home in Blankenburg, West Coast Demerara. Meanwhile, the Office of the Director of Public Prosecutions (DPP), in a release said Sir Fenton was “a great legal legend” of Guyana, the Caribbean and the Commonwealth, serving selflessly, particularly at the Privy Council and the Caribbean Court of Justice (CCJ). In statement yesterday, the Guyana Bar Association said: “Sir Fenton was one of the greatest legal luminaries ever produced by Guyana. He achieved distinction in the field of law at an early age in earning a doctorate in law at the age of 30 and serving as the Attorney General of British Guiana between the ages of 32 and 35. “For over 50 years, since the publication of his treatise ‘The Development of Land Law in British Guiana’ in 1966 when he was 37 years old, lawyers have been thumbing its pages as the standard text on land law in Guyana. “Regionally, Sir Fenton has been earning acclaim since the 1970s in the area of human rights in the many cases argued by him at the regional appellate level and in the Privy Council in England from a variety of Caribbean countries. “Since the establishment of the Caribbean Court of Justice in 2005 and until recently, Sir Fenton utilized his considerable legal skills in representing litigants in the region’s highest Court”. A Ministry of the Presidency statement said that President David Granger extended heartfelt condolences at the passing of Sir Fenton. Sir Fenton appeared on behalf of Guyana in many criminal appeals at the CCJ, the most recent being the case of Mark Royden Williams and James Anthony Hyles, popularly referred to as the Lusignan Massacre case. “The legal community, especially in the Caribbean Commonwealth Region has lost a human encyclopedia where legal matters are concerned, be it criminal, civil or constitutional. He was a bottomless well when it came to the law, which he expounded from his memory, including the history of the law,” the DPP release said. “The passing of Sir Fenton and the likes of him signals the death of an era of legal personalities which once frequented the rooms and halls of our Courts. This in itself adds to the grief which we feel at this inevitable occasion. He must be remembered for his bravery and ability to speak the truth fearlessly,” it added. Sir Fenton was appointed attorney general in 1961, having contested and won on a People’s Progressive Party ticket, the constituency seat of Canal Polders, Numbers One and Two. According to Walter, while he was practising law, in 1961, Mrs Janet Jagan told him they needed an attorney general in the new government and the seat of Numbers One and Two Canal Polders constituency was available. She said she wanted him to be the AG in the new government but he had to win the seat. He won that seat in 1961 and was appointed Guyana’s first attorney general. As history has it, on May 28, 1963, the Legislative Assembly was suspended by a resolution after Premier Dr Cheddi Jagan and other ministers refused to apologise for discourteous conduct at the previous sitting of the assembly. Elections were held in December 1964 and the PPP lost the elections to a coalition government formed by the People’s National Congress and the United Force. Sir Fenton was a Member of Parliament until 1973. Reminiscing on the life of his brother, Walter said, Sir Fenton was the only one of the five Ramsahoye brothers who did not attend Queen’s College, the leading high school of the day, because he did not win a county scholarship. They also had two sisters. “Nevertheless, had he attended Queen’s College, he would have most certainly earned himself a national scholarship,” Walter said. Sir Fenton attended Alleyne’s High School on Regent Street with the likes of attorneys at law Ashton Chase and Brynmor Pollard. The perpetual student, yearning for knowledge, Walter said, Fenton at 20 years, after studying on his own, sat externally a Bachelor of Arts degree from the London University in 1949. He then proceeded to London to obtain his LLB in 1953, when he qualified as a barrister. He returned to Georgetown in 1954 and shortly after, landed a job at the Attorney General’s Chambers. During that time, he was also studying for his LLM and once again, wrote the exams externally in 1956 in Georgetown and was successful. He wanted to do his PhD, Walter said, and it was difficult to communicate with the University of London’s School of Economics and Political Science, so he travelled to London to meet with the professor in charge. “He had a difficult time to get to see the professor in charge but when he saw Fenton, he asked him what he was bringing in order to get this PhD. Fenton said all he had was an LLM, which he wrote in Georgetown, Guyana externally. The professor said to him, ‘I marked those papers. Are you the man who wrote those papers?’ He said, “Yes”, whereupon he told Fenton, ‘There is no need for you to be interviewed. You are admitted to the class to do the PhD immediately.’ He did the PhD in 1959 and his thesis was on the Development of Land Law in British Guiana, which was subsequently published by Oceana Publications, New York, 1966. He came back to Guyana and started practising. Fenton was of the view that the British government did not share Kennedy’s views. They felt that Jagan was not a proper communist, that his supporters were mostly cane cutters and sugar planters and that he would never swing towards Cuba. Fenton felt that the British could not convince the Americans, and the 1964 elections saw the PPP getting most of the votes but the Burnham-led People’s National Congress joining forces with the United Force to form the government. Sir Fenton was also admitted to the bars of England, Wales, Jamaica, the territories of the Eastern Caribbean, including Monserrat and the British Virgin Islands, Trinidad and Tobago, Antigua and Barbuda, and Barbados, where he resided at different times in his life. He was appointed Senior Counsel in Guyana in 1971 and was Deputy Director of Legal Education for the Council of Legal Education in the West Indies and head of Hugh Wooding Law School as a professor from 1972 to 1975.